From Arthur Rankin, Jr. and Jules Bass (The Hobbit), comes a magical adventure with an all-star cast, including Jeff Bridges, Mia Farrow, Angela Lansbury, Christopher Lee, Alan Arkin, Tammy Grimes, René Auberjonois, Robert Klein, and unforgettable songs from legendary rock band, America! Upon hearing that she may be the very last of her kind on Earth, a Unicorn (Mia Farrow) goes in search of others like her. Her quest won't be easy, as it leads her straight to the evil King Haggard (Christopher Lee) and his infamous Red Bull! And the journey is made even more complicated when, to protect her from the envious wrath of Haggard, a spell is cast to turn the Unicorn into the Lady Amalthea, a beautiful, young human woman. But with this new body comes new thoughts and feelings, such as love for Haggard's son, Prince Lir (Jeff Bridges). Will Amalthea get lost inside this new body? Will she meet the fate of the other Unicorns? Or will she be able to defeat Haggard and his Red Bull with the aid of her friends, Schmendrick the bumbling magician (Alan Arkin) and Molly Grue (Tammy Grimes)? 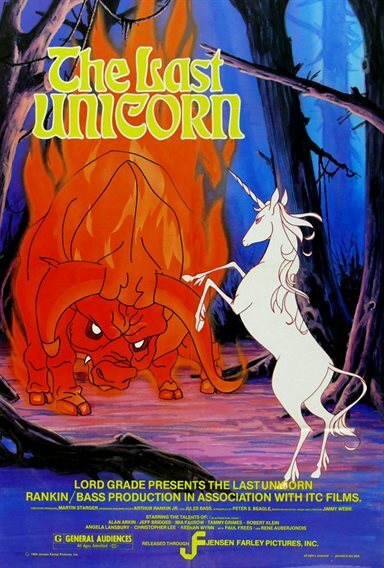 Download The Last Unicorn in Digital HD from the iTunes store. The Last Unicorn images are © Jensen Farley Pictures. All Rights Reserved.